Steven is jealous, possessive, and ridiculously intoxicated. His girlfriend, Emily, won’t respond to any of his alcohol-fueled texts and he’s determined to let every last bar patron know of his frustration. George Packard, an ex-government engineer with a seemingly sympathetic ear, claims to have the solution: a machine that promises to link the couple in a permanent, unconventional way. Steven isn’t sure that Emily will agree to his selfish designs. Though, if they truly are soul mates, Steven’s sure he’s allowed to take some liberties. I feel like my rating is slightly unfair to this story. The writing is quite good. It flowed well, and there weren’t any major grammatical issues, which is sometimes surprising for a self-published work. Gordon obviously knows what she’s doing, and her writing style is very nice to read. And the idea behind the work is VERY interesting. My biggest qualm about this story was that it didn’t flesh anything out. There was the great idea about the strange machine, allowing one to link minds, but you didn’t get much more information than that. You didn’t get much on the main characters. I understand that it was a short story, but I would have appreciated a few more pages to explain a little more. This could be quite an interesting novel, although I get that wasn’t the point. Steven is an impulsive, intoxicated idiot. He has lost all faith in his relationship, assuming that his girlfriend is cheating on him. He was not a likeable character by any means. He meets the mysterious George at the bar, who offers him an equally mysterious solution. I was instantly interested in the science-fictiony machine that George gives to Steven, but unfortunately, I was not given any sort of explanation or follow-up to whether this was the first in a line of sci-fi elements, or how the situation played out. The ending was dissatisfying, as there was a suggestion of what happened, but very little explanation. It was also difficult for me to enjoy because I didn’t care for the main character, so it was hard for me to care about anything he did, or any of his pain. So…I think the idea behind the story would make for a very good novel, and perhaps Gordon has plans for this in the future. An interesting idea, accomplished writing style, but not enough there to be really satisfying. 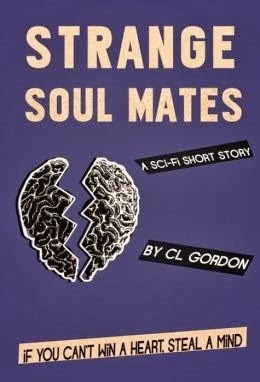 This entry was posted in Book Reviews and tagged Novella, Review Request, Sci-Fi/Dystopia.